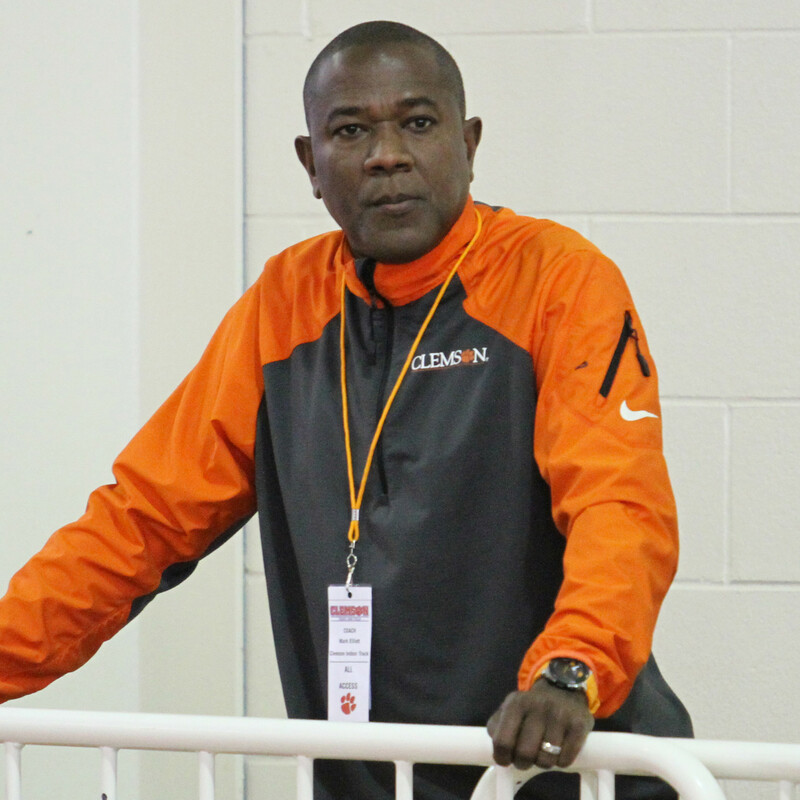 Mark Elliott is in his second season as the head coach of the men’s and women’s track & field teams at Clemson. On Wednesday, he and two busloads of student-athletes will travel to Blacksburg, Va., to brace for the 2015 ACC Indoor Championships at Virginia Tech’s Rector Field House. Elliott’s confidence is different this time around, and for good reason. His women are ranked No. 15 in the latest USTFCCCA national poll, and the men have shown flashes of brilliance this indoor season. Both are set to take aim at much higher finishes in year two of Elliott’s tenure on Thursday. We caught up with the head coach of the Tigers on Tuesday to discuss his expectations the second time around as he prepares for the ACC Indoor Championships. CT.com: Different feeling as the head coach now than a year ago at this time? Elliott: Even though it was my first time to take over a program, the average coach probably takes a good three years to see the fruits of what he or she has brought in relation to the team’s performance. It’s easy to see the difference between last year and this year — it’s the new people we’ve added to the program. One of my favorite words is ‘realistically.’ From a realistic point of view, we are one of many teams that are heading to the conference meet with a shot of winning this thing. If all our athletes compete to the level they’ve competed at all season, and if we get a few breaks here and there, we might stand a chance. CT.com: The women were atop the conference, and then fell to eight last season. What are your expectations for them? Elliott: To be honest, I don’t pay attention to where we’re ranked. The women are used to winning. They knew the reasons we weren’t there (in contention) last year. It was obvious. The starters were gone. And the ones that were here, it took a year to get them to believe in what we’re doing. They’re also good athletes, otherwise they wouldn’t have been here. Now it’s showing. You can always score the championship out on paper — and you definitely do that — but once the meet starts Thursday, everyone is the same. We’ll see who comes out on top when all is said and done. CT.com: Last year several individuals performed well, but there weren’t many threats to win. That has changed this year, hasn’t it? Elliott: That’s a testament to the coaches we have. I was luckily able to hire some great coaches. We all do our jobs with recruiting, and now it’s time to coach them up. We’ve done that well this year. You can point to a lot of kids on the team that have an opportunity to win. But to me, even the person that scores one point is a winner. Our winning needs to come in many different ways. We want 10 big points, but we also will take one or two here or there. When they add it up at the end, hopefully we’ve gotten a lot of those points. CT.com: Do you think one of the biggest differences in both teams this year has been the depth added in the 400 and 800? Elliott: Yes. When you’re in a sport where the scholarships available don’t match the amount of disciplines you have, you need to add more common denominators. You need kids that can fluctuate from one event to the next, and grab points here and there. When you think about the 400 and 800, and sprinters who have range to help on the 4×4, that’s how you start to build a team. We added some good people in those event areas this season, and it’s bearing fruit as we speak. CT.com: What’s been the biggest surprise of your program this season? Elliott: As I’ve learned over the past year being in Clemson, this is an easy place to recruit. There’s always that saying out there when you recruit, but there is a legitimate mix of great academics and athletes here at Clemson. Any athlete you recruit, both sides mean a lot to the parents. You’re not just saying it, though. We knew what we were getting. But my focus as the head coach was to help the kids who were here have that same belief. We needed to get them to buy in to the new outlook. We did that, for the most part. It took a while, but once that happened, we started looking toward championship season. Now, we have a full team on both sides. CT.com: In reality, what needs to take place this week that will satisfy you as the head coach? Elliott: On the women’s side, we need to continue what we’re doing. If we do that, I think we can be victorious in that sense. On the men’s side, we need a few breaks here and there and some others have to step up. We need kids to get into finals that may not be predicted, on paper at least, to do that. I have a firm belief that several kids who aren’t predicted for finals will be there. If they compete like we see in practice, then we could possibly be victorious on the men’s side as well.